What do you think of when you hear the name, Vimmerby? Do you think of Astrid Lindgren? Do you think of Småland? Most people know of Vimmerby because of Astrid Lindgren, since this is where she was born and grew up. She has put her mark on the whole area, and today Vimmerby is the place where families find adventures and the very best experiences. The award-winning Astrid Lindgren's World, Virum Moose Park and the beautiful contryside are examples of the sort of outings that provide every opportunity for a fun-filled holiday. Opening hours: Shops open Monday-Friday 10-18, Saturday 10- at least 14. Department stores and food shops have generous opening hours, also open on Sundays. Astrid Lindgrens Vimmerby is perhaps "Sweden's most playful destination", and for good reasons too. 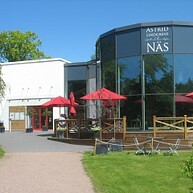 One of the many places you'll find here is Astrid Lindgren's World, where Astrid Lindgren's characters come to life. Just outside of Vimmerby, you'll also find the real Katthult as well as Bullerby where the films were made. Why not make a visit to her childhood home situated just a short walk from the town centre? There is, of course, a whole lot more to discover, for both young and old. 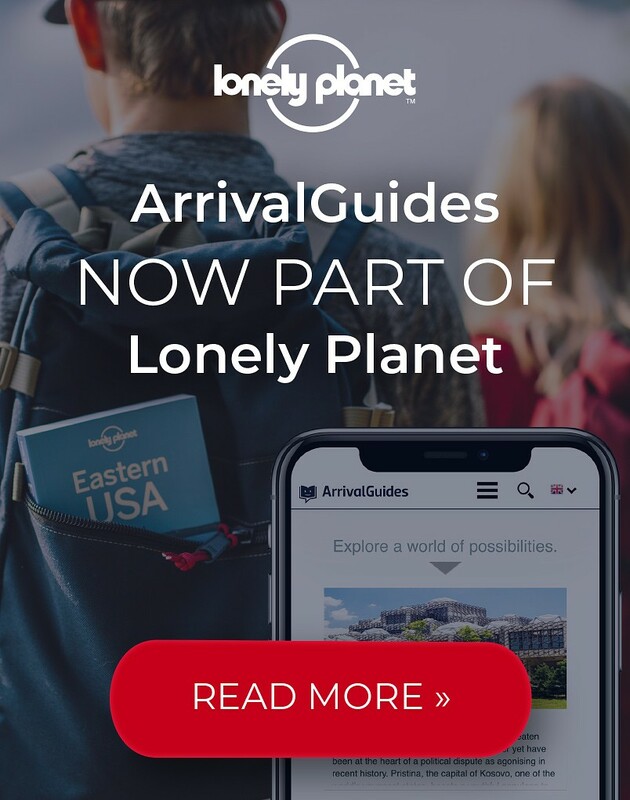 We have listed some of our most popular attractions. On our website you can find a complete list of all our attractions. 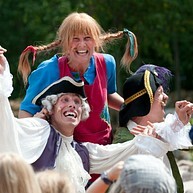 Astrid Lindgren's World is Sweden's largest open air theatre with its many stages where specially written plays, based on Astrid Lindgren's stories, are performed daily. It's a great experience to get to meet and play with Pippi, Karlsson, Emil or any of the other favourites. 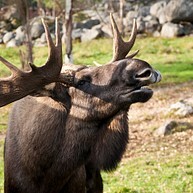 Come and see moose and deer in their natural habitat. Climb on board the safari vehicle and take a guided tour in the beautiful surroundings. You will be able to get very close to the animals for an unforgettable experience. In the 'Älglogen' you can enjoy a coffee break. 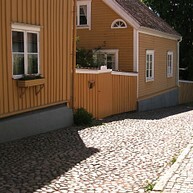 The three small houses in Sevedstorp were the inspiration for Astrid Lindgrens books about the Bullerby Children. In the summertime the village comes to life, with different animals, possibilities to jump in the hay and in one of the barns you will find Café Sörgården where waffles, Swedish cheescake and goodies are served. Walk amongst the buildings and relive the atmosphere of the Emil movies. You can look inside the wood shed, meet the farm animals and visit Katthultsboden, the little shop where souvenirs, ice cream and warm and cold drinks are sold. 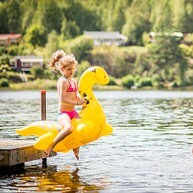 Vimmerby Adventure is an adventure park with family activities like pedal boats, minigolf and water balls. The adventure park also has a high- and low rope course and a 450 meter long Zipline. A little bohemian and tranquil family friendly place just outside of Vimmerby. The permaculture garden with mini farm, a small country shop and Café/Eatery invites you to calm and relaxing atmosphere. Welcome to Lidhem, a green destination for all ages. The Hultsfred-Västervik Narrowgauge Railway. 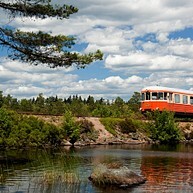 The narrow-gauge railway is Sweden’s longest historical treasure. The Hultsfred-Västervik line was finished in 1879 and was in service until 1984. During the summertime you can once again experience the sensation of riding the 50’s style orange-n-gold railcars. A trip that stretches over 70km on a line that’s scarcely a meter wide. 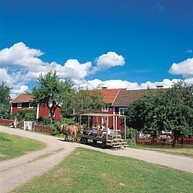 Eriksgården offers natural adventures with the horse in focus and accommodation at the farm. 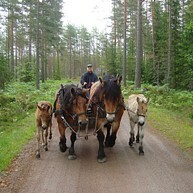 An extraordinary forest experience with guided horse and cart rides for the whole family in Småland's idyllic natural surroundings. In the winter, providing there's snow, we organise sled rides. Welcome to one of the largest museum for those who like motorcycles in general and motocross in particular. 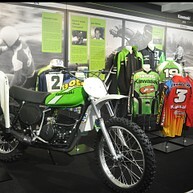 The museum has a blend of unique technical innovations and bikes that have won World Championships, ridden by the great sporting legends of Motocross and Enduro. Welcome in and look around and enjoy several decades of MX history. Swimming, sunning, relaxing, and perhaps playing next to a beautiful inland lake is what many people dream of on a beautiful summer's day. In the surrounds of Vimmerby, there are lots of small lakes ideal for swimming and fishing. At several of these lakes, the local council has set up leisure areas with sandy beaches and jetties. Åbro Bryggeri is Sweden’s oldest family-run brewery, and one of Europe’s most modern. Since 1856, Åbro Bryggeri has been brewing beer with water from the same spring in Vimmerby. Åbro Bryggeri brews a number of beers, such as the flagship Åbro Original and the premium series Bryggmästarens. Get to know the history and production through a guided tour or visit the restaurant Brygghuset with and experience the new micro brewery. Beautifully situated by the millpond in Storebro, 7 minutes from Vimmerby, you’ll find a model ship with 40 of the most beautiful songs and hymns from the 20th century carved into it. You can come and sing the songs together or just enjoy the views of the lake. Kvill Oak or Rumskulla Oak is a fine example of one of Europe's oldest and largest trees with an estimated age of 850 to 1,000 years. 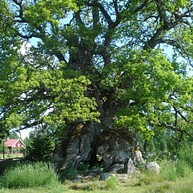 The Kvill eken is one of the few big trees remaining in Sweden. You'll find the oak tree a few kilometres south of the national park. It measures 13m in circumference. Cultural History Museum in Vimmerby. The museum is housed in an 18th century timber dwelling with original Baroque ornamentation. 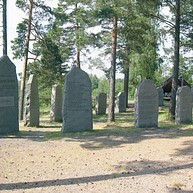 One exhibition is devoted to the graveyard at Gästgivarhagen on the outskirts of town. Some items have been restored and are now exhibited at the museum. There are several themed exhibitions during the year, visit the homepage to find out what exhibition is shown right now.